"98% of magicians who use a knife in their acts wouldn't last one second in a real knife fight." What kind of "impressive" knife do you use in your routines? As a younger magician, I used to perform a comedy version of the cut and restored rope. When it was time to cut the middle of the rope, I reached into my coat and pulled out an 18" Bowie hunting knife. The knife was almost as long as my arm. What a shock to the audience! I used that Bowie knife for years. Then for awhile, I switched to cutting the rope with a fancy switchblade which I had purchased in Northern Italy. Nobody had seen a knife quite like it. Years, later, like many other magicians, I switched to flourishing a butterfly knife (Balisong). The two parts of the handle spun to open and close the knife almost with the speed of a switchblade. Very impressive -- it shows off the dexterity of someone skilled with his (or her) hands. There was a marked difference in the stages of knife wielding in my magic act. When I used the Bowie knife, I knew some martial arts, but I hadn't studied weapons specifically. I thought I knew a lot, but in retrospect, I would have been killed (literally) in a knife fight. In my switchblade stage, I had progressed in my martial arts studies. I was now more acquainted with weapons. I felt I knew a thing or two about knife fighting. Most Martial Arts Offer Knife Advice That Doesn't Work! By the time I was training with butterfly knives, I realized that my previous three martial arts styles taught knife-fighting techniques that just wouldn't work in a real fight. Fortunately, I found out in class, with aluminum training knives, that left welts and bruises on my arms, but no real cuts. Lesson(s) learned. Eliminate the short, staccato blocks followed by an attack (cut with the knife). You can't afford to pause between two motions. Instead, learn techniques where one technique "naturally" blends in to the next. If your motion has an end to it, and the next technique has a distinct beginning, an advanced knife fighter will easily pick up on the gap. He'll take advantage of the milliseconds of extra time. Find techniques that close the gap. Don't give any extra time to react. Avoid moves where you "have to" switch your knife grip, in order for the move to succeed. A switch in grip should be your idea, not required for the sequence to work. Multiple grip moves are rarely practical in a real fight. How difficult can fighting with a knife be? You pick up the knife and you stab, right? A child could do it. Everybody thinks they are a great knife fighter. Especially, if as a kid, they watched action movies, and later played at pretend knife fighting. We all learned to wave the knife back and forth, and maybe even switch it from hand to hand. The knife fighters in the movies always seemed to keep the blade moving. Always in motion. If your opponent can perceive a repetitive motion -- a repeated action of any kind -- then he can intercept that path with a slash of his own. Can you really keep a knife in constant motion without creating a pattern? Bruce Lee advised moving with a purpose. Don't move your knife in energy-wasting patterns. Also, the blade-brandishing shows you're an amateur ... who has watched a lot of action movies. * Some bold, off-hand remark could offend the wrong person. * Participation by a female helping out in a trick could be perceived as flirtatious advances by the magician. * A sucker effect might not be accepted with a fun-loving attitude. Make someone look the fool and they could get very offended. * Any time you fool someone, there is the potential for the spectator(s) to feel slighted. Even if you don't mean to, your minor miracle might be thought of as showing off your superiority. I'm not saying that a spectator will interrupt your act, and suddenly pull a knife on you. That kind of outburst is rare. But it's less rare for someone to want to get even after the show. Or at some later date. Guess what. You probably won't surprise your attacker with your knife, if he has seen your show. You performed some impressive flourishes with your blade. Even if you don't whip a butterfly knife around your hand, if you used your knife during your act, then the attacker knows you have a weapon. If you demonstrated almost juggling-like skill with a knife and the attacker is still willing to go after the magician, then your attacker wasn't all that impressed with your knife demonstration. Think about it. Your pursuer knows that you have a knife and still attacks you. This says something about your attacker's martial skill, mastery of a knife, size, ... or intellect. You could be in deep trouble. Whether you are an accomplished knife fighter or just a beginner, you must learn a set of skills just for knife fighting. Your oppoenent thrusts in with the knife. If your arm raises in defense, you have provided a new instant target. Your arm. A slight change in direction of the stab or pulling the knife back a bit, and you've been cut. Make sure that each and every response you make in a knife fight gives you the opportunity to cut. All of your responses must include a cutting (offensive) component. In other words, if you aren't cutting, then you are being cut. We pretend to accomplish real magic. We act the part of a magic worker. We lie left and right, while on stage. Bluffing may work some of the time, but in this case, it's better to have skill to back you. Your life could depend on it. Some magicians take up martial arts, because the recognize the potential dangers of presenting oneself as a confident performer. But they don't learn enough to really benefit them in a fight ... especially one involving knives. In their martial arts classes, knives aren't discussed at a beginning level. It could take years before the secrets of knife fighting are revealed. And those secrets might not be good enough to save you. And most of the books on the subject just give a trick or two -- not enough to save you in a real encounter. You need something that works now. You can't afford to wait years. And you don't want to gather a bunch of useless advice from library books. Take my word for it. Having real confidence in your ability to protect yourself and others is one secret you will easily keep ... until it becomes necessary to quickly and efficiently deal with the problem. You are a magician. So am I. Did you know we have a distinct advantage over the majority of the population? More than just knowing secrets they don't know. We, as magicians, have the abilty to practice. In fact, we like to practice. We perform a technique over and over, until mastery. In a sense, it's very similar to martial arts. Martial arts practitioners are also familiar with practice ... at least the good ones are. Now, I want to be frank with you. There is a difference between practicing magic and practicing knife fighting. As magicians, we practice alone a lot. Once we have perfected a trick, then we begin practicing it on a confidant -- a spouse, best friend, or fellow magician. To practice knife fighting, you'll need a partner, right from the start. The only way to get good at knife fighting is by learning to react. And you need something to react to, right? Thus the need for a practice partner. Find someone else who would like to learn self defense with a knife, and you'll both learn at a fast rate. Stage fright gets a little adrenalin coursing through the body. An attacker waving a knife back and forth (Amateur!) gets the adrenalin flowing with the force of Niagra Falls. And that fact is of paramount importance. You won't think. Realistically, you may not have time to think or plan a strategy. You need to be able to react quickly. Review Tip #3: Make sure that each and every response you make in a knife fight gives you the opportunity to cut. Make sure you practice drills and exercises that build your automatic responses. And make sure those responses contain offensive cuts and thrusts. Magicians aren't the only ones who don't really know how to handle a knife properly -- professionally. You may find this hard to believe, but most martial artists are pitiful when it comes to knife defense. Their rigid training has killed any natural reactions that the individual martial artist may have had. Their motions are stiff and predictable. The smarter ones understand the need for a more practical way to respond. The recognize the desire to learn to react automatically. I know that many martial artists feel this way from experience. I am the senior editor of Martial Arts Mastery: A Tell-All of Tips, Tactics, and Techniques. This is one of the longest-running martial-arts ezines. Thousands of subscribers responded to a survey on their martial needs, fears, motivations, and dreams. By far the most popular response was the desire to become more proficient with weapons. And of the weapons mentioned, knives scored the highest. So, I wrote an ebook for martial artists. 10 Days to Better Knife Fighting Works! As a fellow magician, I understand your need for fast results. You want to spend time perfecting your craft. Magic is important to you. But please, also spend time learning to protect yourself. Whether you decide to take the quick, efficient route by learning some knife technique, or decide to go the slower route of taking martial-arts lessons, you need to take steps to stay safe. A knife is a tool. A tool allows you to accomplish your goal more efficiently. But you have to learn to use the tool properly, or it won't do much good. * Drills and exercises the teach you to react without thinking. * The advantages of outside fighting and how to pass a knife to the side. * The dangers of inside fighting and how to shut down bad angles. * The only time you should throw a knife in a fight. The exercises are fun -- almost like games. But these games teach you to react with the best moves possible. You build on your own natural responses by learning efficient lines of attack, the only way to check or block a knife attack, and how to respond to a fake. I know in the world of magic, tricks, books, and DVDs don't come with money-back guarantees. 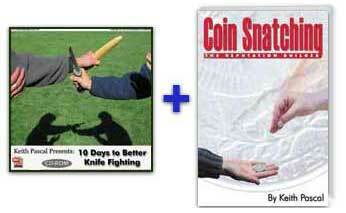 Note: After reading "10 Days to Better Knife Fighting," you will be able to defend yourself more efficiently with a knife or your money back. Guaranteed! Face it. There is a lot of bad information on the Internet. Every "Joe-Martial-Artist" (and magician) down the block has something to try to sell. If you don't know me (Keith Pascal), then you don't know about my career as a respected martial arts and magic writer -- a writer who focuses on practical martial arts and self defense. I have written five martial-arts books, 17 martial-arts ebooklets, and over 600 martial-arts articles. I am also the senior editor of Martial Arts Mastery, one of the longest-running martial-arts newsletters on the Internet. In the world of magic, I am the author of Coin Snatching: The Reputation Builder. I have also co-authored articles with Lee Asher. We have regular columns in Channel One and The Magic Circular. I have also helped Lee write Catch 33, Three Stylin', The Diving Board Double, and more. As a respected author I stand by my guarantee. Whether you are a beginner or already proficient with a knife, these exercises will make you better, automatically. Do you attend magic conventions? For me, they are few and far between. If you'd like to arrange a private martial arts lesson, you'll need to pay for my expenses to a convention you'll be attending, and then tack about $200 per hour on top of that. (And I still want time to attend the convention.) Figure on dropping a couple of thousand dollars for my participation, and that doesn't include your own expenses. For about 1% (one percent) of the above expenses you get an ebook that's like having me there with you. No Credit Card or Paypal Account? No Problem. Click here!